Last week, I had a lovely post planned for this space. Memories of barbecues from when I was a kid, and evocations of the taste of well-charred meat, and elaborate analogies to make you laugh. But you know what? That farm-to-table dinner that Danny and I cooked on Friday took most of our minds’ space last week. We loved the sun-glowing day (we haven’t seen the sun much around here, so excuse the hyperbole). We loved the chance to cook together all afternoon, with friends, and even with a small person at pantry a few times. We loved meeting so many of you, making the connection with faces and stories, and humbled to hear how much you love reading here. Thank you. It was a glorious day. Wow, though. I was exhausted the next day. As much as I loved the work being about slicing carrots, grilling slices of sourdough baguettes, and pureeing curried red lentils, instead of sitting in front of a computer, I am not used to being on my feet for nine straight hours. Danny didn’t blink. He does this every day. I’m in awe of him. Me? I needed to sit down on Sunday, and not in front of a computer. And now, when I thought I had cleared a couple of hours to write this post, Lu has decided that 10 pm is wake-up-and-frolic time. I can hear her in her bedroom, running through the entire catalog of songs she has begun to sing this week. “Tinkle tinkle dar!” she shouts, then glides right into “Ashes, ashes, all down,” which slides into “Up down! turn aroun,” from the Wiggles. People, I don’t think we’re going to bed until midnight tonight. We’re in the middle of a growth spurt. There’s too much joy to sleep. So, I’m going to go fast, in a list form, and tell you about the week we ate out of Spike Mendelsohn’s The Good Stuff Cookbook: Burgers, fries, shakes, wedges, and more . 1. Do you remember Spike? If you watch Top Chef you do. He was the slightly cocky, slightly obnoxious, slightly loveable chef who tried to portray himself as Johnny on the street (with a tweed fedora) but actually had a whole raft of classical training and fine-dining experiences under his belt. I was sort of annoyed by him and sort of pulling for him that season. He seared frozen scallops, which turned to mush, and then he went home. 2. And then he opened this restaurant in Washington D.C. called Good Stuff Eatery. (Even when you lose on Top Chef, you get a lot of attention, particularly if you set out to make yourself a recognizable character.) From all accounts, it’s fabulous. Burgers, fries, salads, sides, and shakes, made with fresh ingredients and classic techniques and little chef twists that make each one outstanding. He’s gotten a lot of press for this place. 3. From that, this cookbook. (I have to tell you that The Good Stuff Cookbook: Burgers, fries, shakes, wedges, and more is published by Wiley, which is publishing our cookbook in September (!!). Also, our amazing book editor edited this book. This, and the free copy, really didn’t affect why we cooked out of this book, however. It just looked good, right in time for grilling season.) The cookbook is bright, full of vivid photographs, and stuffed with smiling people and crisp brown fries. It’s not pretentious. It’s not trying to be anything other than what it is. We liked it. 4. The book is credited to Spike Mendelsohn in big letters, and just underneath it, in small type: Micheline Mendelsohn. That’s his sister. How cool is it that this guy wrote his book with his sister? The book, and the ethos of Good Stuff, is clearly all about family. Danny and I love that, since it’s what’s important to us too. Good man. 5. Spike makes his mayonnaise with grapeseed oil. That makes it a greeny green. I haven’t decided if that makes it look like it belongs in the Munsters’ house or if it’s a soft pastel, like the first photos of spring taken by hip girls with Pentaxes. Either way, it was sure good. 6. The Good Stuff sauce, slathered on all the burgers at the place, uses this green mayonnaise with molasess and other secret ingredients. I just fricking loved it. I could put it on every sandwich and roast chicken and in eggs. Really addictive. 7. The toasted marshmallow milkshake. Oh, I was so excited about this one. Apparently, it’s the calling card of the Good Stuff Eatery. Everyone loves it, craves it. And to make it, you toast marshmallows under the broiler, so they take on that charred, almost blackened but raw in the middle experience that you get when you’re an impatient kid at a campfire. I was SO excited about this shake. Bleh. It was way, way too sweet for me. Maybe it wouldn’t be for you. After all, it’s popular. I’ve lost much of my sweet tooth since I was pregnant with Lu. Ripe raspberries taste perfectly sweet to me, and anything else is too much. Still, Danny has a famous sweet tooth, and he couldn’t finish this shake either. So that was a disappointment. 8. The fries from the book, however, were great. Danny has been telling me for years about the towering piles of shoestring fries, hot and showered with salt, crisp and addictive, that he used to make at Cassis, here in Seattle, when he was the sous chef. However, Cassis closed and he has never made me those fries. We made the fries out of of Spike’s book, the first fries we had ever made together. Oh yeah. I miss fries. Did you know that if you have to eat gluten-free, you can’t eat French fries in most restaurants across the United States? Fries are most often fried in the same oil as onion rings and other gluten-containing goodies. Do you know how often most restaurants change their fry oil? Um, not often, according to Danny. So all that gluten hangs out there and contaminates the potatoes. Much better to make them yourself at home. The Good Stuff Cookbook makes it easy for you. 9. However, I think I enjoyed the baked sweet potato fries with thyme and honey even better than the French fries. These are keepers. 10. I was grateful for the salads in The Good Stuff Cookbook. Not only because they are interesting combinations of flavors  and lots of them wedge salads with iceberg, which I’m starting to love  but also because I needed a respite from all the burgers and fries. 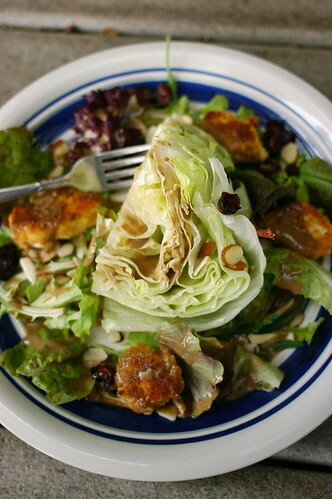 This was the wedge salad with fried goat cheese, dried cranberries, and slivered almonds. Fried goat cheese! I’m keeping that one too. 11. The truth is we tried to eat out of this cookbook all week long, the way we normally do with the cookbooks we feature here. We gave up after a few days, though. I just couldn’t eat one more burger. There are vegetarian burgers and turkey burgers and tamarind-glazed pork burgers with red cabbage slaw and grilled pineapple. They all sounded fabulous. So it’s not as if we had to eat a big hunk of beef every day to cook out of this book. The sides alone would have sustained us. I wish that the watermelon at the store had been good so I could have made the grilled watermelon, yuzu, and feta salad. Soon, I will. 12. That’s the thing. This is a great book if you want to use it occasionally. With the Fourth of July coming up this weekend, we’re pulling it out again for the big party we’re attending on the island. Maybe I’ll bring the perfectly roasted wild mushrooms or the zucchini fritters or the farm-fresh potato salad. I may not want burgers two days in a row (and the day after we made the burger, fries, and the toasted marshmallow shake, I swore I wouldn’t be eating a burger of any kind for months), but I like this book. 13. The Good Stuff Cookbook is fresh, filled with good flavors, and doesn’t take itself too seriously. We really dig it. We think you will too. So we’re giving away a copy. Tell us a story about burgers or fries or your favorite side for a barbecue or what you consider good stuff (food done right without any pretension). We want to hear. 14. Frankly, the book was worth it for us because cooking out of it forced me to finally create a recipe for gluten-free hamburger buns I like. And frankly, after you read the title of this post, that’s probably the only thing you wanted to see. I’ve been wanting to bake hamburger buns that make me happy for about 5 years. I don’t mean those starchy, super-flimsy grocery store buns. I mean the buns that are really great bread rolls, crusty on top and soft inside. If grocery-store buns are a Casio keyboard, then great rolls for hamburgers are the organ at Westminster Abbey. Well, last week, I started singing Hallelujah. After all the baking work we have done these past two years, and what I have learned about bread baking in general, I created these. And then I did it again, and again, to make sure this wasn’t a fluke. It’s not a fluke. You could be eating these for the Fourth of July this weekend. The recipe was inspired by the hamburger buns in the Gourmet cookbook, which many people told me was their favorite. I’ve also been playing with making sponge starters for bread recently. I like them with gluten-free baking, in particular, because sponges build more flavor and a better structure to breads. We can always use that with gluten-free. I learned this technique from the incredible book Baking by James Peterson. It’s my new baking bible. I’ll be sharing much more soon. After fiddling and eating, I came up with the rolls of my dreams. Golden crusted and a little crisp, with a soft crumb and air holes. These are not too dense. (You couldn’t use them as hockey pucks.) They don’t taste funny. In fact, the many people whom I handed these to in the last few weeks could not tell they were gluten-free, at all. And here’s a bonus. If you have a baguette pan, you can use this recipe to make crusty baguettes. If you’re new to baking, this recipe might seem long and fussy. Believe me, it’s worth your time. You could be eating toasted hamburger buns this weekend. Or maybe even tonight. Update. Please read: A few of you were kind enough to write to me here and on email to say that the batch of hamburger bun dough you made was too wet. Perplexed, I shook my head and thought. I’ve made these at least five times before writing it. What could be wrong? I just figured it out. When I originally typed this recipe (sleep-deprived, at the public library), I transcribed the wrong numbers from my recipe notebook. Instead of 70 grams of potato flour and almond flour, as I had originally written, it should be 140 of each. Big difference! I’m sorry to those of you whose doughs turned out wet from my mistake. (I have to stop typing up recipes when I’m so tired.) But thank you for writing and pointing out the error. Combining the flours. Put the all-purpose flour, the almond flour, and the potato flour into a food processor. Mix them for a few moments until they have become one, coherent flour. Using the food processor aerates the flours in a way that seems to really help the bread. If you don’t have one, then use a stand mixer or a large bowl and whisk, then sift the flours into another bowl. This only takes a few moments, and it will really help the final buns. Making the sponge. Measure out 210 grams of the combined flours into a large bowl. Warm the milk in a small saucepan until it is barely warm. After you have put on the milk, let your tap water run warm until it is 115 degrees. (This is the temperature when the water runs over your wrist warm, the same warmth as your flesh.) By the time you have added the water to the flour, the milk should be warm enough. If it’s hot at all, wait a few moments for it to cool down before you add it to the flours. Add the milk to the flours, then 165 grams of the water, and stir them all to combine. Stir the sponge well until it has the consistency of a thick porridge. If the sponge is too thick, add more warm water until you have the right consistency. (Each kitchen, depending on the heat and humidity, and elevation of where you are, will be slightly different.) Sprinkle the yeast over the mixture and let it sit for 3 minutes. Stir. Cover the bowl with plastic wrap and allow it to sit in a warmish place until it has doubled or tripled in volume, about 1 to 2 hours. Finishing the dough. Put the remaining flour and the sponge, along with the guar gum, melted butter and eggs, into the stand mixer. (If you don’t have one, you can do this by hand, with a lot of bicep work!) Mix until the dough is coherent, about 2 minutes. Cover the bowl of the stand mixer with plastic wrap or damp towel and let it sit for 20 minutes. Once you have scraped the dough down into a one ball, shape it with damp hands into one coherent dough. (See photo of that here.) Put it in a lightly oiled bowl. Cover the dough with plastic wrap or a damp towel and allow it to sit in a warmish place in the kitchen until it has risen to twice its size, about 2 hours. Baking the hamburger buns. About 1 1/2 hours after you have set the dough to rise, preheat the oven to 425 degrees. If you have a pizza stone (and boy, does it help with gluten-free baked goods), put it in the oven to come to temperature. Line a baking sheet with parchment paper or a Silpat. When the oven is fully hot, take the dough out of the bowl. It should feel good in your hands, like a traditional bread dough. (If it’s sticky, because you let the sponge grow for longer than 2 hours, simply wet your hands and work with the sticky dough.) If you want small buns (like sliders), cut the dough into 8 pieces. If you want larger hamburger buns, divide the dough into 5 pieces. Roll each piece of dough under your hands until it feels like a good ball of dough. Place it on the baking sheet and flatten it just a bit with the palm of your hand. 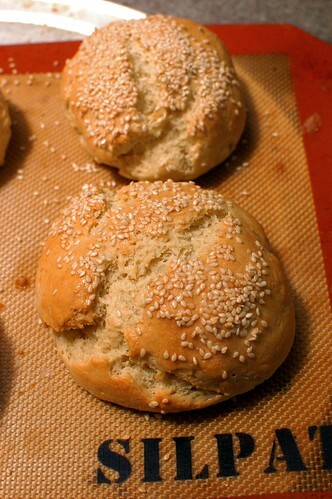 If you wish, brush the top of each dough ball with the beaten egg, then sprinkle with the sesame seeds. Put a large sheet tray into the bottom rack of your oven. Fill it 1/2 way full with water. (I pour it from the tea kettle.) Slide the sheet tray with the dough on top of the pizza stone (or on a middle rack, if you don’t have a pizza stone). Spray the inside walls of the oven with water from a clean spray bottle. Close the oven door. Wait 30 seconds. Do it again. Bake the hamburger buns until they are golden brown, give a good hollow thump on the bottom, and have reached an internal temperature of 180 degrees (but no higher). This should take about 15 to 25 minutes, depending on the size of the buns you make and your own oven. How much all purpose flour is required – it seems to be missing from the ingredients list? Any chance I could use rice flour in place of the almond flour? I'm allergic to almonds, and if you have a quick hint for me before I experiment on my own, that would be a bonus. Thanks for the recipe!! Hey Shauna thanks so much! I have been craving hamburger buns! I noticed you wrote all-purpose flour in the recipe but I do not see it there? Am I going a little crazy? Let me know please! Thanks again for doing what you do! In this recipe it doesn't say how much all purpose flour to use. Help please! Yumm! Can't wait to try these this weekend! A burger just isn't a burger without a sesame-seed topped bun! Thank you Shauna! I wonder if the list of ingredients is incomplete? The instructions list all-purpose flour but I do not see that in the ingredient list. I'd love to try this recipe, I miss my home-cooked burgers more than anything now that I'm GF. I'm also at about 8000 feet so baking can be tricky. Thanks Shauna! Thank you thank you thank you for your magic baking bbq bun blitz! I have to admit, I've temporarily stopped baking gf bread after discovering UDI's whole wheat gf bread in the Ballard Market. I've been saying that I wished Udi made buns. Now I can make my own. Thanks Hon! I am so excited to read about these. My daughter (six years old, and new to eating gluten free) actually cried over how much she missed hot dog buns this week. She is usually so good natured about this, and she feels so much better. However, a bun-less hot dog was simply more than she could bare! I think I will try to shape these like a hot do bun, and see what she thinks. I am just missing one piece… How much all purpose flour mix did the recipe need? Thanks so much! She thinks your graham cracker recipe rocks by the way. I altered it a bit and made it into tasty "pop-tarts" with homemade strawberry paste and she loved them too! I'm excited to try that recipe one day! I love how candid you are about the book, its why I love your blog. You point out the up sides, but notice that its clearly written by the sister, even offering a hint at why you see that and most importantly that you couldn't use it all week long, etc. You're honest and it is appreciated! Oopsie! The measurement for all-purpose flour (all purpose GF flour, I assume,) is missing from the recipe. Other than that, they look great, and I can hardly wait to make them! you're fast! I published this at the public library, picked up Lu at her afternoon day care, stopped by the restaurant to give Danny a kiss, came home, and found all these comments! There was a weird glitch — I hit the wrong key on the library computer — and the AP flour measurement and one paragraph of the instructions was in tiny type. YUMMY! perfect timing too, just in time for a long weekend when I will have time to make them. Thank you thank you thank you! I don't suppose you've ever tried the CIA gluten free cookbook? I can't get their bagels to work for the life of me, and wonder if you ever tried to make them? Funnily enough, I came here tonight to find a good recipe for hamburger buns. So glad we're somehow on the same wavelength. 🙂 And thanks for the honest review; I'll be checking out the cookbook very soon, if for nothing other than the sauce. Turnip makes yummy fries! We use cooked millet in our home grown burgers. I'm copying the bun recipe. Hopefully it'll stop raining long enough for a bar be que. If I can't use butter, can you recommend a good substitute? Can't wait to try this, hamburger buns are really something I miss. what if you dont' use the yeast would the recipe still work? could I sub a lesser quantity of baking soda? Love it! Can't wait to make them! How is it that I missed this? Or did I? It's dated the 23rd but I am just seeing it today, the 29th? Am I doing something wrong? Gaile, somebody gave me the CIA baking book, but I haven't baked anything out of it. It feels too fussy to me, with 8 different mixes required, and each recipe calling for three of those mixes. And I don't think they bake by weight, which is silly, because I'm sure they do at the CIA. Amy, I must have read your mind. Elle, I've never tried turnip fries! Anonymous I and II, I don't know about substitutions, because I've never tried them. I like the Earth Balance buttery sticks for butter, and I'm sure it would be good here. Without yeast? Ay. That's tough. Try it and see what happens! Cathleen, thanks for reminding me. I put the photos in the 23rd, intending to publish last week, and I forgot to change the date! I just did. Dang it, now I have to make these. My GF friend is laid up after having hip surgery yesterday. I think GF hamburgers would be just the ticket in a couple days when she's ready for company! Thanks Shauna! I'm sending this link to my friend who's gluten intolerant too…I'm sure she'll love this! As long as my burger is medium rare, I am happy. It has to be pink for me! The best burger I ever had was at Iron Hill Brewery in Delaware. The best fries I ever had were at Nathans. Speaking of Nathans, who remembers Nathans? Fries are nothing compared to those knishes. If you have seen the movie, "Crossing Delancey," you have seen Nathans. In one scene, some crazy lady comes in Nathan's, in Coney Island, singing outloud about "true love." I really want a knish when I think of that. I have not been to that Nathan's for around 35 years, but it was good, and so were those knishes. That is one thing for sure I am going to make: a gluten-free knish. That is my stupid story, but I am not a cookbook collector. Just say this: Cuh nish, and stress the second syllable. It should rhyme with that show, Commish! Oh, and Ahern Flour, gotta love it. Oh man. I can't do corn. What to sub for corn meal in the flour mix!? For those wanting to sub for butter- coconut oil is a good dairy-free sub that we have used. You can't taste it in the end result. We do it in our pizza dough all the time. To sub for the yeast, sometimes baking powder/soda and salt will work, but you will have to play with it to get the ratios right. I am also a fan of the sponge technique and have been using it with pretty good results for several years now. Depending on how long before I want to have some, (and if I can remember to plan ahead) I will let the sponge develop for as long as 24 hours. The flavor just keeps improving. And, if you take pity on all of us holdouts and include volumes, thanks! What is the conversion of grams to cups for this recipe? I'm so excited to try it out! So happy I found you! Recently started dating a wonderful guy with Celiac and am doing lots of research to find out what fabulous things we can cook and eat together. There's so much to learn. 🙂 Your site makes eating gluten free seem like a wonderful adventure and not an inconvenience. The recipes look amazing and your photos and writing are really lovely. So inspiring! I'll be checking in often! We are big fans of burgers (especially with roasted red peppers and caramelized onions on top). Can't wait to test out your bun recipe! The sweet potato fries look incredible. This post totally got me in the mood for grilling out and enjoying food this weekend. Yum! Home-made fries sound so wonderful! My guy and I have talked about getting a fryer but the kitchen is so small it seems just too much to shoehorn in. (and dangerous, as in once we got started would we want to stop? LOL) We got some cast iron dutch ovens for baking and plant to experiment with them for frying. Now I just need to figure out how (& where) to best store the used oil! Thanks for the bun recipe- it's exciting! We use the sponge method for bread, too, even with mixes. I've had sponges working for as long as two weeks when illness prevented our using them and the flavors just get better! http://www.onlineconversion.com/ but there are plenty more to choose from. For us, the sides are the whole barbecue! We have a vegetarian house, though Hubby is an omnivore. When we first bought a grill, we got one with a 1/3, 2/3 split grilling space and agreed he could put meat on the 1/3 and eat it on paper plates. He did it exactly once–we love the veggies and they need the whole grill! Our go-to grillers: Haloumi cheese oiled and grilled in a fish basket; zucchini & summer squash covered in lemon juice, olive oil, dill & salt; marinated portabellas; and asparagus. We also do potatoes with eggs cooked inside! Cut the top off a potato, scoop out the inside with a melon baller, crack an egg into the hole. Then you put the top back on and wrap it all in foil. Throw it on the grill (or in a fire). SO GOOD, and the best breakfast leftovers! Looks absolutely delicious. 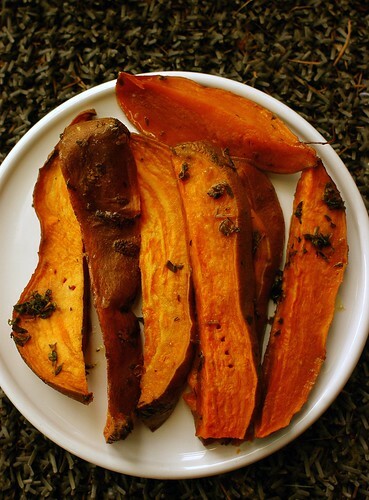 And, omg, sweet potatoe fries :0. Oh, goodness, the rosemary fries at the Good Stuff in DC are really kind of amazing. Thanks for reminding me of them! I haven't been there in a long while. Apache Burger, in Etobicoke, Ontario, is brightly-lit, with colourful tile walls, including a mosiac that piece-by-piece portrays Marilyn Monroe's fresh face. It has been in operation since 1267. At least that's what my Dad used to tell me. I believed it when I was a kid. My Dad's family was koo-koo, with lots of brothers and sisters bickering and parents nagging, so he used to go there to study. He'd get an Apache Burger, onion rings, and a strawberry malt and work the night away. Through middle school, high school, his bachelor's, and finally his master's degree. I have been eating burgers there since before I can remember. I liked everything plain, and the man behind the counter always silently scoffed at the nakedness of my burger. My parents and I have moved away from Etobicoke, to live by the sea in Nova Scotia, but it is always the first place we go when we visit. I can't eat much there anymore, but they wrap up the patty in lettuce for me and I can still enjoy the strawberry malt (minus the malt). My husband is working in Toronto for the summer, far from me and our new home. It is hard, but it is an exciting opportunity for him. I am flying out tonight to visit him and I know, on the way in from the airport, he will take me to Apache Burger. I don't even need to ask. I would love to have a copy of The Good Stuff Cookbook, to recreate some of those beloved burger-joint classics to celebrate my husband's homecoming in September. Many years ago, when I was 20 years old, I went vegetarian. A couple of years after that, I moved into an ashram to study yoga and meditation, where we were also celibate. I ate a lot of brown rice. A lot. A whole lot. And had a guru. A crazy guru. A guru who ended up getting booted out of the ashram for not doing the celebate thing himself, and in the worst way. But while I was there, he was there. And while I was there, although I loved the yoga, and the meditation, I began to get a bad feeling about the ashram, and the guru. One night I snuck out and went to a local restaurant, sat at the bar, and had a burger and fries – the first meat I'd eaten in over three years. I got a tummy ache, but something in me, something profoundly WHO I AM, felt marvelous. Over the next six months, I went to that restaurant once a week or so, to have a burger and fries, to chat with the cute bartender. And with every week, this ritual of meat, potatoes, and talk, began to free me. One day, the guru trapped me in a room, but through force of will, a will made stronger by breaking the rules each week to go to that restaurant, I got away. A week later, after the burger and fries, I asked the bartender to help me come back into the world, and loosen the hold of the celibacy rules. He did. Four weeks later, I moved out of the ashram, and the year after that, the guru got the boot. You're going to hate me for saying it, but I work near Good Stuff Eatery (have been since before it opened) and have never eaten there. I guess it never appealed much to me because I don't eat burgers, or drink milkshakes, and I try to avoid fried things. Not to mention I live under a rock and was only vaguely aware that Spike Mendelsohn had some sort of celebrity status. But maybe I should give it a try! Shauna, I'm confused about the baking part. You said to heat a pizza stone (which I have) but then said to use a baking sheet & Silpat. Is is an either/or or do you sit the baking sheet on the pizza stone? Please clarify. Also, thanks so much for this and all your other fantastic recipes! no more fries?!? well, in the end i guess it's good to know. you're timing is perfect – just last night i was talking w/ my dear Hubby about how much i already miss hamburgers (and it's only been 2ish weeks of gluten-free living) – but it's been warm and i want to grill burgers! so, as overwhelming as this recipe feels – i think it's time i bought myself a scale and we'll give it a go – thanks ever so much for sharing! the cookbook sounds great btw – i recently made these burgers w/ loads of chopped up fresh basil and diced garlic – they were such a hit – even w/ my youngest who tends towards the bland and fearful in his eating – and for me they were perfect – i melted gobs of mozzarella on mine and put it on top of a salad – oh yum – almost didn't miss the bbq sauce! that, was a long post! cannot wait for your cookbook! I was intrigued with the green mayonnaise, you had me at the Toasted marshmallow, and I think I started drooling over the fries. I don't remember much after that. I was too busy rushing off to the Amazon site to put this book on my wishlist. as for my burger story: my most memorable burger was eaten in Thailand in Chang Mai. I was with a group and we had just come off a homestay where our diet consisted mainly of rice (lots of rice), egg, and sauteed vegetables. We headed straight for a burger joint and chowed down. Just a good greasy Cheeseburger with a side of crispy fries AND onion rings. After a week of no meat or grease that food heaven! The next morning we all got sick as dogs and had to bend over toilets for the first part of the morning. It didn't turn me off burgers or fried food forever, but it did teach me a lesson. When your system gets unused to something, it's not wise to overindulge when you reintroduce it back into your diet. I make bacon cheddar burgers using organic, grass fed beef. I shred a 1/2 lb of Applegate farms Sunday bacon, 1/2 cup of shredded Irish cheddar cheese, two slices of toasted Samis millet/flax bread as bread crumbs(run thru the food chopper), and one egg and mix this all together in my mixer. I use a hamburger press to makes sure they don't puff up. I like my burgers to look as good as they taste. A typical side to a burger in our house would be steamed broccoli tossed in a olive oil, lemon, garlic dressing with some toasted almonds. I love your blog! I am with Lea. I have a tree-nut and peanut allergy in addition to the gluten issues. Can you recommend a good replacement to the almond flour? I love burger/fries/BBQ side stories! Although here in NC, I get corrected pretty quickly if I say BBQ and what I really mean is a cookout. Last week we made turkey burgers with feta, parsley, kalamata olives, red onion and garlic. We topped them with a hand chopped tapenade of olives, parsley, garlic, olive oil and crushed red pepper. They were pretty darn good and we loved them even more warmed up in the oven (wrapped in tin foil) the next day! We also made oven fries with generous shakes of Old Bay, something we started being obsessed with on our honeymoon in Carolina Beach after being served just-out-of-the-fryer housemade potato chips with no other seasoning but Old Bay. They were a very nice treat and somehow complimented the burgers in just the right way. Thanks for reviewing this book! I'm always inspired by good, honest American fare done right. Burgers and BBQ, my favorites! My husband makes a killer cuban style burger. A beef burger w/ some cumin in the mix topped with Black Forest ham, long pickle slices, fontina cheese, and dijon spiced mayo on bun. Once the burger is cooked most of the way you constructed the delicious tower and wrap in tin foil. Put it back on the grill with a brick or some other weight on it for a few minutes, it's amazing gooey goodness. Dominic also makes the best ribs I have ever had. The ribs bask in a liquid of homemade beef stock full of spices and garlic. The key is pickling spice. Wrap in tin foil and cook in the oven, the smell in the house is heaven! We finish them up on the grill with sauce. Shauna – I'm a little confused. I've spent the afternoon making this recipe, and was careful to measure and weigh everything accurately. I'm at the final state after adding the salt….and my dough was wetter than cake batter. Nothing close to coming together and making a nice dough. I've added almost 1.5 more cups of flour to try and make something that resembles a dough and it's still pretty (Really) wet. Any ideas? The recipe calls for 1.5 cups of water, right? Samantha! Send me an email (mailglutenfreegirl@gmail.com) and I can walk you through what happened. Gluten-free dough is always wetter than regular dough, but something sounds amiss. Write to me! My GF roommate and I just started experimenting to find a good burger bun. Looks like we know which to try next! Your article makes me wonder if there's any similarity between Good Stuff sauce and Red Mill's. No prizeworthy story but you might find this handy: if we have hot coals left after grilling, I put an oiled eggplant on the barbecue with the lid on. The last of the coals cook it nice and smokey, ready for baba ganouj. Those are lovely looking burger buns. I am fascinated with the idea of making a sponge for baking bread. I think I inadvertently did that a few months ago when I taught a GF baking class and brought the demo bread (which was rising) home, and left it in the car overnight. The next morning I baked it, after a very long overnight rise, and it was one of the best breads (GF or otherwise) I'd ever eaten. Can't wait to try your recipe. And btw, you've inspired me to weight my flours when baking and I'm loving the process (and the final result!). I just emailed! Thanks so much for your help! Wow, those buns look amazing and I have yet to try to make a gf hamburger bun or find one at the store that I like. Do you happen to have the gram conversions to cups?? Great post and looking forward to following you more! i made some lamb burgers recently that were fantastic. they had a mint parsley yogurt sauce. i love a good burger! I am very excited about your new recipe here! I've been using a store bought bun that is largely composed of mozzarella cheese (weird right? ), which are tasty but a wee bit too rich to put a hamburger on. My favorite thing about grilling is that my husband pretty much does it all. There's just about nothing better for someone with Celiac to be able to sit down with a glass of wine post work while someone else you trust totally prepares your meal. It isn't often that I feel completely comfortable eating food someone else cooks for me, so I very much appreciate anything my husband wants to throw on the grill! One of the big perks of moving back to my northern Canadian hometown to work is that there is a burger and fries place, only open May-October, that only puts fries in the deep frier. And they make the best fries. They taste like the homemade ones my mom would make for me when I was little. It's run by this wonderful woman who is always there, and it's open about 12 housr a day, 7 days a week. She's been doing it for years, I want to say at least 30 years. It's an institution in our town. I was so glad I could keep eating their wonderful fries (with salt and vinegar, sometimes dipped in sour cream) after I was diagnosed with celiac disease. Oh, and for those folks that mentioned they were thinking of getting a deep fryer – I won one this winter at a curling bonspiel, and I love it. I would have never attempted deep frying without it, and I'm so glad I chose it from the prize table. I've been making chicken fingers (sometimes I get a big craving) with the Kinnikinnick panko bread crumbs and they turn out really well. I just visited Good Stuff Eatery this week and LOVED it! As a non-red-meat-eater, I usually steer clear of burger joints… but the veggie burger at Good Stuff was hands down the best one I've ever eaten. Anyway, I would love a copy of the book, if only to figure out if I could modify the veggie burger recipe to make it at home without a deep fryer! I've changed the numbers in the recipe, as you can see from the note above it. Thank you for your comment, FrereAndres. It was your math that made me realize something was wrong, after receiving a couple of emails. I made another batch this evening and realized I had written down numbers from an earlier recipe. Instead of 70 grams each of almond flour and potato flour, it should be 140 grams each. So sorry. It's the right recipe now. And Roz! You're right. I've changed the cherries and water to grams too. Eventually, they'll all be grams and I'll alienate even more people! Interesting, now we see the gum…Why not using a mix of xanthan and guar instead of guar alone? Should allow to have less in total. I have read somewhere that something like 1/8 tsp Xanthan + 1/2 tsp Guar if more "effective" than 1 tsp of guar alone… (less taste, better "fabric" to retains gases). Have you tried to separate the eggs and beat the egg whites to try to boost the air bubbles. Sorry one more thing, the resting time between the shaping and the baking is missing, and i am thinking that with all the various proofing times we need to feed the yeast a little more… aside sugar, what can we use to replace distatic malt powder… I am still searching for that. Thank you so much for this recipe. I cannot wait to buy a scale once we are in a home that offers more storage space (we list on Thursday!). I feel for you and the growth-spurting Lucy. Henry is a year next week and is growth-spurting and teething…I am a zombie most days! I wanted to comment on Spike's. I live four blocks from Good Stuff and it is indeed busy all the time. The restaurant is closed on Sundays, which speaks to the ethos of the place you identified. Personally, I am a fan of the chocolate mini moo (a kid-sized version of the chocolate shake). Most people I know who have tried the spectacular toasted marshmallow are more impressed by its appearance than its taste, finding it cloying as you did. As to Spike…I had the same reaction as you when I saw him on Top Chef. However, I met him recently when he judged the amateur dessert contest I organized for our Moms on the Hill picnic. He is snarky and very nice. I thought the fact that he donated his time and some custard to our community event was incredibly generous! I would love to know if I could make a batch of these and freeze them for later use. Thanks! I have a batch of hamburger buns in the oven as I type. The recipe was a little more complicated than I thought and probably wasn't a good after work choice but it looks good so far so I'm looking forward to a taste! Might have to break my not eating after 6pm rule to have a sample fresh from the oven! Oh my. I was trolling this blog today to capture your lovely burger bun recipe (I've now been gluten free long enough to begin to emerge from mourning and start looking for workable life solutions to important foods.) I ran across the fact that Danny was a sous chef at Cassis. Oh my. Wait, I said that already. I LOVED Cassis. I was so upset when they closed. And the classic steak frites. That was my favorite. So here is the face of one of the chefs who made those lovely creations. Sorry, dear. Fan moment for your guy. Can these be made using a GF sourdough starter to make the sponge? I'm new to GF baking, with a 6 year old son just diagnosed with celiac, and I prefer to avoid baker's yeast. I have made bread a few times, glutenous bread, mind you, and it has gone just fine. I attempted these buns and found the sponge quite soupy, which i remedied by adding a little more of the total flour mixture initially. Unfortunately, though I (tried) to do everything as written, the buns came out flat, and hard as rocks. Not overcooked, just… too solid. Help? Anyone? I desperately want the buns in that picture! Jane, how long did you proof your sponge? Mine took a bit longer, as did the rise of the final dough. But they came out grand in the end! As I sit here with my partner, eating the first of these from my oven (I finally made some, after what 6 months) we are both nearly speechless. Nearly, because we are saying things like “wow”….”mmmmm”…”these don’t taste gf at all”….”these are waxing toward sourdough dude”…(I let my sponge sit overnight, then let the dough sit overnight…). Girl, these are nothing short of DIVINE. Obviously I need to get my process down to a one day affair, but all I can say now is “DAY-UM these are some FINE bits o’ bread girl! !” 😉 THANK YOU THANK YOU THANK YOU! Now I just have to resist eating them all at once. This looks amazing! Question though: When I clicked on Aherns all-purpose gluten-free flour mix the link was expired and no longer there. Could you fix it? I’d love to make it but I couldn’t because of that! Hi Shauna: Just found your website. Your story sounds like mine. But I think I’m several yrs older, with probably more damage as I’m now dairy, egg intolerant. Also, I can’t eat meat without pain. Same story with the doctors. I’m going to go gluten free and hopefully things will be better, then take the results to my doctor. But what is in your flour mix, is there a recipe on your website. I would like to try make these buns. Or do you have a substitute mix/blend you recommend. I live in Southern Ontario, Canada sometimes different flours can be hard to find. Thanks for website and your story. Mix them all up in a large container. Put on the lid. Shake it around. You have flour. I’m really exicted to have found your blog, I’m a newly diagnosed celiac. I’ve noticed a few of your recipies call for almond flour. Can you recommend a healthy substitute? Shock of shocks, I’m allergic to almond too. I’d love to try your hamburger bun recipe tonight, but in your recipe you link to “Aherns all-purpose gluten-free flour” and the link is broke and I can’t figure out how to search your recipes for it. Any suggestions for making these without the gums? In the last time to rise the dough. Wanted to mention, the link that was shared, for the all pourpose flour,is different than the recipe for all purpose flour. I used the one on the site labeled, Aherns All. HOpe all the dough turns our for everyone, what ever recipe is applied. My teen boys loved the buns! Yeah! Thank you for all the detailed steps and pictures. Worked out beautifully! Can you make these again! What a treat , a hambuger bun that tastes so good. Hi Shauna! I’m new to your blog. I find your posts inspiring and am less afraid to enter the world of gluten free baking. I don’t have potato flour on hand an would love to make these buns. Can you recommend a good substitute? Thanks! I can’t find what Ahem’s gf flour is. I really really want to try this recipe, but I’m afraid to not knowing what the all purpose blend is made up of. I’ve wasted so much stuff in the past just winging things!! Thanks! It’s easy, Kelly! You use 40% whole-grain flours (sorghum, brown rice, teff, etc.) and 60% starches (potato starch, tapioca flour, sweet rice flour, etc.) So for example: 200 grams sorghum, 200 grams teff, 200 grams potato starch, 200 grams sweet rice four, 200 grams arrowroot. Mix all that up in a container and you have flour. I just finished making these. The final result was a little gummy. Any ideas where I went wrong? Shauna, just wondering if you have tweaked this recipe to remove the gums at all? I am new to GF baking but have learned a tremendous amount from your blog. I appreciate your experience and all the knowledge you’ve shared. Connie, I just made this recipe with a slurry of 1.5 tsp of flax seed meal mixed up with 3 tsp of boiling water. It worked fantastically well! Shauna mentioned before in her post here about substituting for the gums, and the ratio for it she used, just in case you were wondering. Best bread I ever made, honest! The link for the ahern’s all purpose gluten free flour is not working. Can you please provide me with it? I love reading your blog. You have the most creative recipes and I love your narrative. If I wrote a food blog, I imagine it would be a lot like yours. Big question, the link to your AP GF flour in this recipe is missing – or rather expired. I was wondering what the recipe was. *Edit – Nevermind, found it in the comments. I was thinking about using this recipe to make a loaf and using it to make stuffing for Thanksgiving. Do you think it would hold up to stove-top cooking? If not, any ideas what might? I doubt any commercially available GF breads would. I am curious if anyone has experimented with this recipe but substituted the chia slurry for the gum? If so, what amount of chia did you use? I’m working on this recipe tonight for my just had to start going gluten free son and I was wondering. When you say put the liquid measurements in g do you mean to weight it out on the scale or is it supposed to read mL? Thanks! you weigh it in grams, just like the flour. makes it easy! Any chance you have a north American version of this recipe, with the flour and liquid measurements in cups?